No idea what it is or if it's a butterfly or a moth. 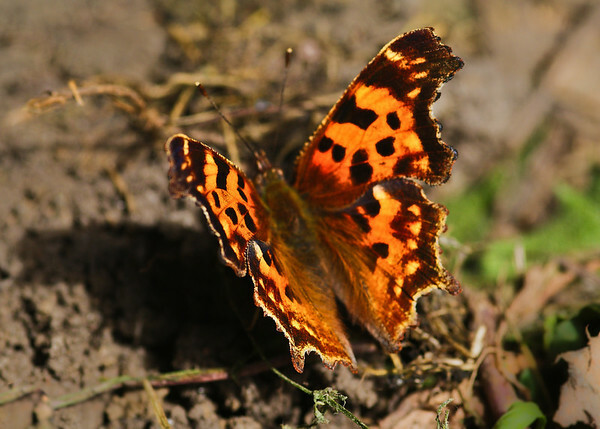 Identified by Chika as a Comma Butterfly. Really like the DOF. The butterfly almost looks antique. Really does it matter? Amazing shot. Nice!. I like the colors and patterns. You are right about the weather. It is summer in Netherlands/Holland but there are showers in between which kind of bothers me. Excellent catch! Great colors and patterns. Wonderful capture! Wow, what a brigtht color! Wonderful catch! This is butterfly known as "Comma". There are some species commas in USA. Great capture of light on the wings.